We offer five Virtuemart extensions; downloaders and an advanced MP3 Player. 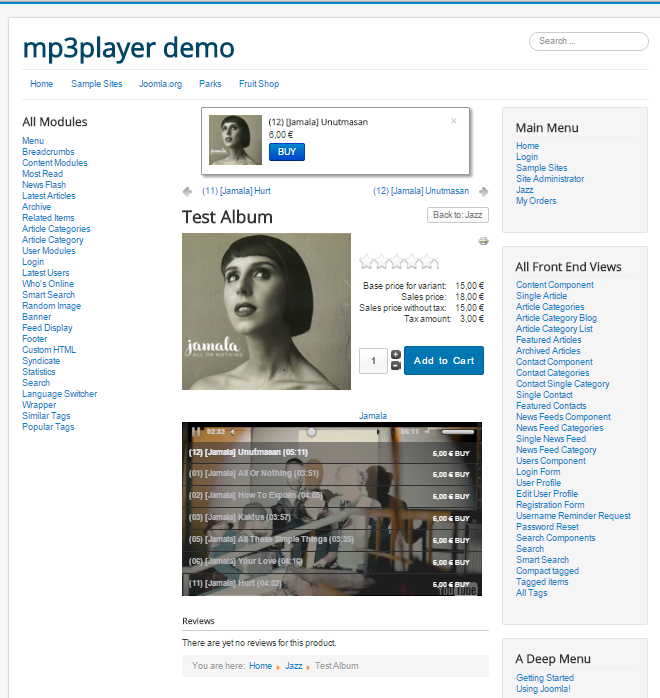 Advanced Media Player is a scrollable CSS-based user interface, floating over the JW Player, version 7, displaying a program list or playlist of video, audio programs. Each program is associated with a Virtuemart product; either a downloadable product or merchandise product. The programs are configured as VirtueMart child products, under a parent product. Each child is configured with the Advanced Media Player plugin and configured with separate links to both preview and download file. There is nothing like this media player because it permits the publisher to showcase or preview audio tracks VOD of live video in the background. This video can contain related music videos, live studio feeds, video advertising -- all at the same time. Soon - we'll be adding an optional plugin that allows the Advanced Media Player for JW Player 7, to preview and deliver on-demand video and audio, streamed with secure HLSe. It would allow individual media shops to offer streamed audio, similar to the new generation music sites. Please review the demo video below, and download the trial to see the power of the Mediagration Advanced Media Player. Our famous MP3 Player User Interface, on top of the cutting edge Bit Movin MPEG DASH player.